ST. JOHN'S, N.L. -- Newfoundland and Labrador had an unexpected oil price spike to thank for some slight deficit relief reported in Tuesday's fiscal update. The cash-strapped Atlantic province reported a $547-million deficit on Tuesday, compared to the $683-million deficit projected in this spring's budget. The projected spending for the year remained on target at around $8.4-billion. Finance Minister Tom Osborne pointed to the over-budget Muskrat Falls hydro megaproject as the province's biggest economic liability. Osborne said the last three years have been the most economically difficult in the province since the Great Depression, but he remained confident that his financial plan will get the province back on track. 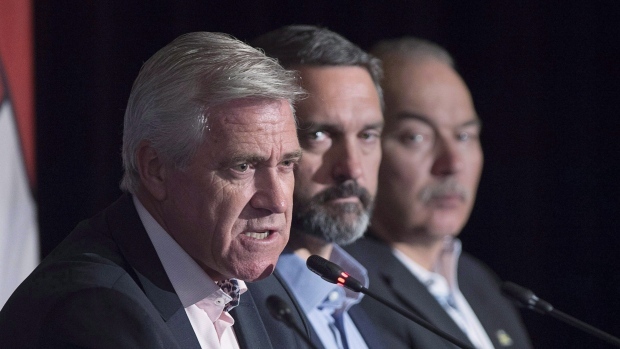 Richard Alexander of the Newfoundland and Labrador Employers Council said the forecast relies too heavily on the price of oil and he doubts the governing Liberals will meet their promise of balancing the budget by 2022.